The first time I made this soup was sometime in 2013. It was a craving soup end of the week kind of day and I had very little vegetables left to play with. There it sat on the third shelf in the refrigerator staring back at me. 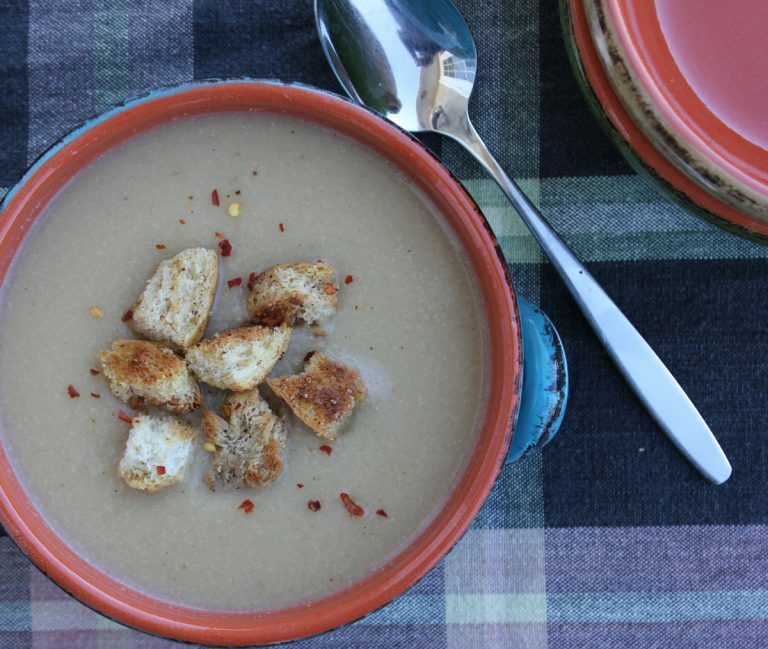 There was no way around it – it was to be cauliflower soup or nothing. Admittedly I’ve never made cauliflower soup before but I sure love roasted and grilled cauliflower.I turned on the oven, hacked up the cauliflower, tossed in some garlic cloves for good luck, a little oil and off it went into the oven. What happened next was outstanding. I made Roasted Cauliflower soup, and I loved it. You have to agree, roasting your garlic with the cauliflower is pretty clever, and imparts great flavour. I wanted the soup again, so I took it a step further this time, and tossed in a couple shallots to roast them up to. I do not add cream to this soup but blitz the cauliflower, garlic and shallots like crazy to keep it healthier. The roasting party in my oven became soup on my stove. I like it when this happens. A few extra minutes to simmer on the stove with thyme and bay leaves, then it gets blitzed, strained and is ready to serve. Those who can not eat dairy will appreciate this soup is dairy free. If you are gluten free do not add croutons. 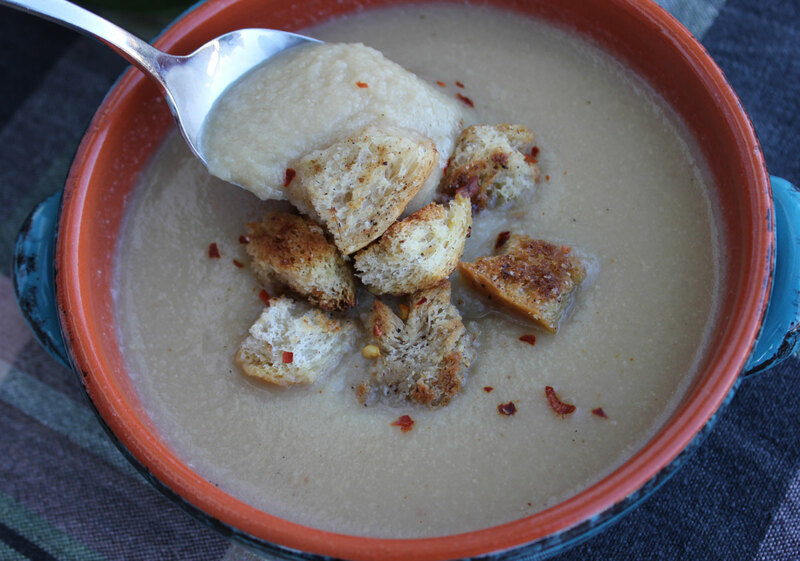 I quickly made some cumin croutons for this soup, but you can use any croutons you have on hand. I made croutons so often I will need to share the recipe. Simple flavours make it delicious. This should serve 4 pending how big your servings are.